Currently home routers with Wi-Fi AC support 3 and 4 simultaneous data streams to provide higher wireless speeds, thus if we connect a client who also supports these multiple streams, we will use all the bandwidth the router allows. However, there are many devices that incorporate only one flow such as smartphones and tablets, which makes wireless network much slower affecting faster clients. With MU-MIMO technology we will optimize the overall performance of the network. MU-MIMO (Multi-User Multiple Input Multiple Output) is a technology that is part of the standard 802.11ac and uses beamforming technology to focus the signal on wireless clients, it is also capable of allowing simultaneous transmissions to clients. If we have a three-stream router but we connect customers that are 1-stream, wireless network instead of working at the maximum speed provided by these 3 data streams, will work at the maximum speed that one stream provides. So far, it’s logical to think the wireless network will always run at the maximum speed that the client supports, but in this scenario we connected two other clients, the best performance will be divided among the three users connected and transferring data in the network because one will transfer information first and then the other (in series). The MU-MIMO technology, the router can send 1-stream data to each client, so the data is sent simultaneously and the bandwidth will be used to the fullest. The three clients send and receive data simultaneously (in parallel) and not in series as with the SU-MIMO (Single-User MIMO) technology. In the above photo, you can see the performance of clients has been tripled when using the MU-MIMO, since we only have three clients. MU-MIMO will not only allow us to maximize the bandwidth of the network so the clients get the maximum speed, but it can also accelerate that more wireless clients transfer their data because we gain additional time for sending data simultaneously to clients. To take advantage of this new technology that is already built into high-end routers, both the router and the clients must support MU-MIMO, otherwise we will not notice any improvement. 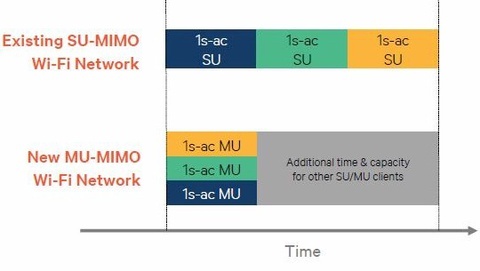 Putting together MU-MIMO and SU-MIMO devices, we will notice the performance has increased but not as much as if all computers were MU-MIMO. 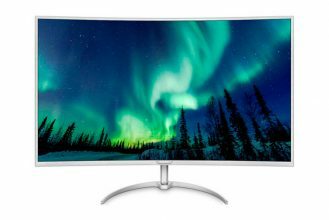 The MU-MIMO technology is ideal for real-time services such as video and online games as they are transmitted quickly without waiting an additional time “until it’s” our turn.